Enjoy the best of both worlds! Enhance the comfort of your mattress with the Luxury Support 2.5" Memory-Cell®/Natural Latex Topper! 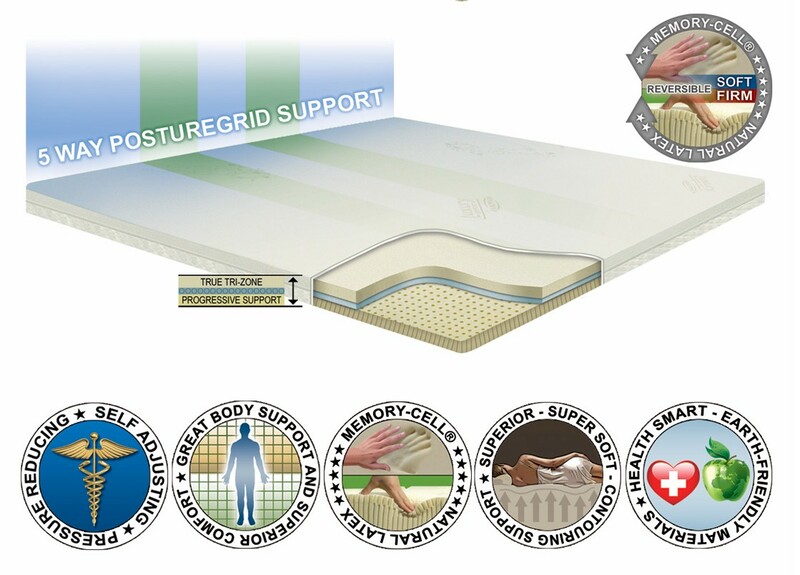 This Dual-Sided Topper (Mattress Overlay) features one side with Premium Talalay Latex Ultra-Form posture support & Natural Bamboo super plush cover material and the other side features premium Memory-Cell Visco Foam with a Natural Organic Cotton Cover that offers comfort beyond compare! The unique Dual-Sided cover is removable, refreshable & cleanable for years of enjoyment! This 2.5" Dual-Sided Topper Comes In A Roll-N-Tote™, Reusable, Earth-Friendly Circular Bag/Package (Pictured) That Is UPS Shippable!